This pea sheller is perfect for smaller gardens but will accommodate larger ones as well. An update to the original Mr. Pea Sheller, the Electric Mr. Pea Sheller has been recently improved with an all aluminum finish which makes it very lightweight and compact. It is small enough to carry under your arm but is powerful and productive! Adding to the efficiency of the machine, the splined rollers automatically adjust to the size of the pea to precisely hull the pea. Perfect for purple hull, black-eyed peas, pink-eye peas and cream 40's. Safety features include an on/off switch, a cooling fan to impede overheating and fully enclosed belt guard mounted to the side of the sheller to prevent accidental contact. The motor is completely enclosed inside the machine, so there is no need to worry that something will get caught in the motor. To use, simply spread the beans out atop the bin on the sheller. The slight slant of the bin allows the beans to seamlessly roll onto the rollers for shelling. Once the peas are shelled, they will drop into the pan while the shells will fall out of the other side to be discarded. Perhaps the best feature is that the Electric Mr. Pea Sheller comes FULLY ASSEMBLED so you can begin shelling peas as soon as you get it out of the box! 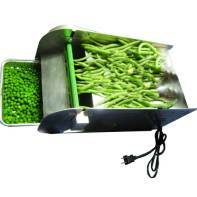 **You will love your Electric Mr. Pea Sheller, but sometimes you just have a handful of beans to shell.